Nature intended young children to move. 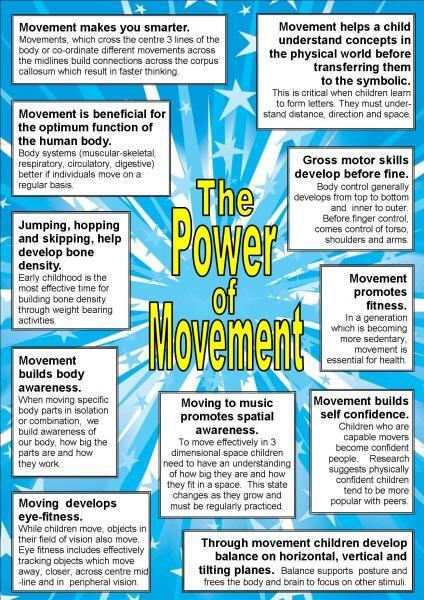 The development of movement causes the growth of an intricate network of brain connections necessary for optimum brain development. By adding music to the movement we can enhance the learning opportunity: language, imagination, creativity, and socialization are enhanced; musicality is developed and all the learning becomes more memorable when it is associated with melody and song. 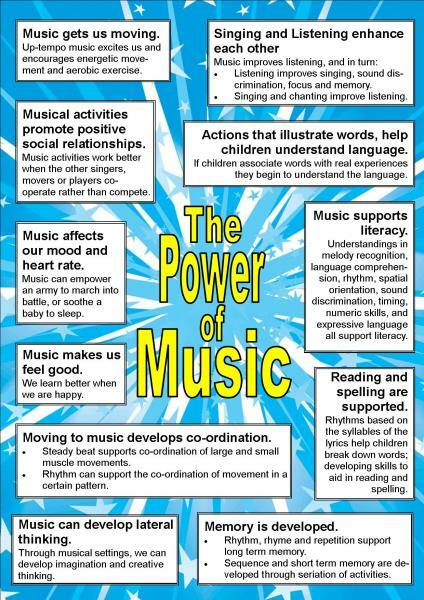 All of a child's essential learning areas can be developed through well written interactive music for children. Early childhood is the optimum time for this learning, as important brain connections made during this time last a lifetime. The relationship between music and movement has been observed probably as long as human beings have walked on this earth. We only need to look at (almost) any child and their natural reaction to the sound of music, to see movement follow the perception of music practically immediately. And for the normal development of the child music is of paramount importance. 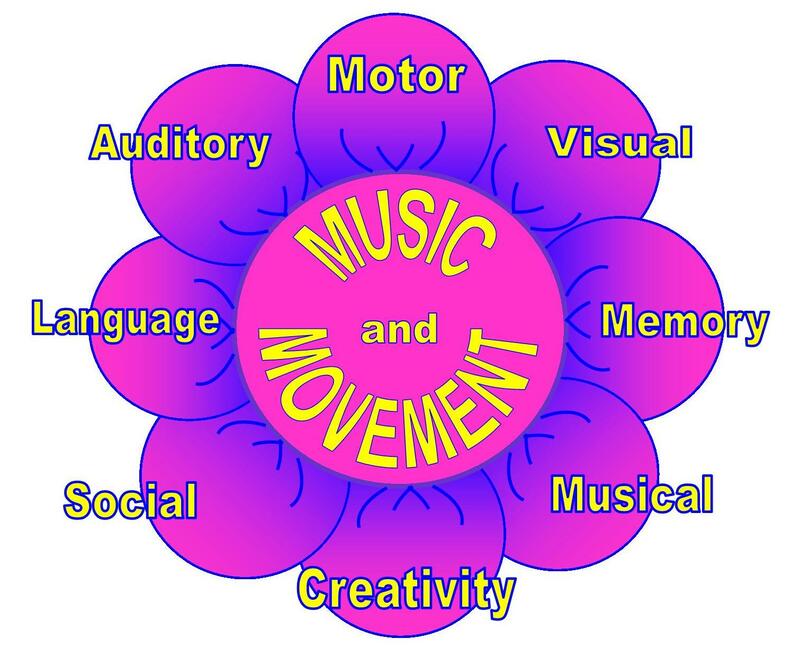 This simple but essential human phenomenon of "movement on music" finds its expression in the many dances of every culture in the world; and in artistic forms in ballet, eurhythmy etc, Increasingly music is also acknowledged and developed as an important therapeutic tool. But how and why does the hearing of music lead to movement? The relationship between music participation in childhood and the later development of mathematical abilities has been known for a considerable time. Clarifying and researching the neuro-physiological pathways of the relationship between music, the brain and movement is only in its infancy, yet shows promising results. New brain-imaging techniques indicate a distributed neural pathway comprising locally specialized cortical areas, both receptive and expressive, which are involved in these processes. There is a large and increasing body of knowledge underpinning the beneficial effects of active participation in music and movement in childhood on the healthy and balanced development of the human being. Continuing endeavours and initiatives from Kids Music Company (KMC) strive to achieve exactly that ideal of balance. Kids Music Company aims to provide musical experiences to develop the whole child through skills developed in the following areas: motor (physical), auditory (listening), language, visual, memory, musical, and social. Multi-sensory experiences are proven to help children develop integrated brains for faster thinking. Through nurtured teaching and a supportive environment, a child experiences success and therefore builds improved self-confidence, and a positive self-esteem. Kids Music Company's song collections continue to provide opportunities for children to develop essential movement skills. These movements in turn develop important connections in the brain. This is serious learning but also serious fun. By utilizing the combination of music and movement in our activities children can develop a huge variety of skills: physical, visual, linguistic, aural, and musical, while extending memory, creative thinking and social skills. These skills give children a huge advantage in learning and help them fulfil their genetic potential - and it is fun! Many of today's children are struggling to achieve academically. Some schools cut back on the arts or remove recess altogether to focus more on the "Three Rs". Such changes are not improving a child's success in the classroom. In order to enhance brain development young children must move; and when they are young, one of the best and most effective experiences is through the arts and through play. The combination of movement, music, and fun makes a powerful learning tool. It's simple. When children are active, their brains receive a huge amount of input through the senses, and through movement. A child's brain processes information about the surroundings as he/she explores texture, sights, sounds and tastes; and begins to make involuntary and then, later, intentional movements. All this data is processed simultaneously and causes the child's brain to build a network of connections. As movements become practised, automated and then co-ordinated with other movements, the network becomes more complex. This network will be pruned and refined as a child grows, and is essential for later success in formal learning. By adding music to movement activities, all senses are involved in the learning (with the exception of taste and smell): sight, vision, touch, balance, and proprioception (understanding one's position in relation to other objects in space); the learning opportunities are multiplied enormously, and new vocabulary and confidence also develop.